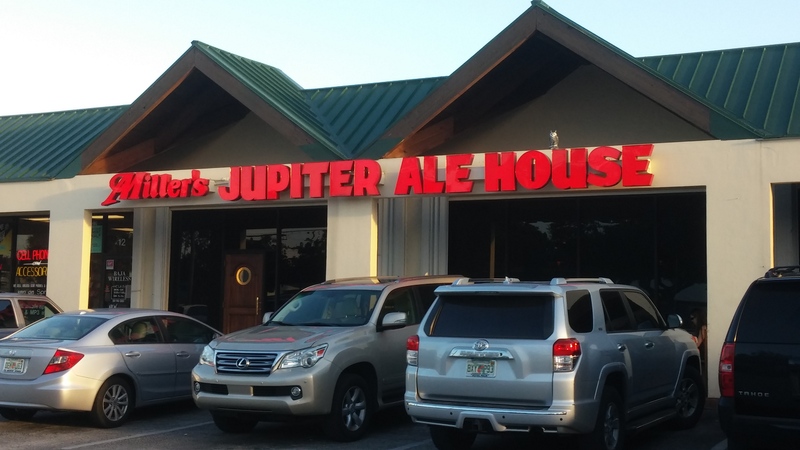 Nestled into a shopping center in the heart of Jupiter, the Jupiter Ale House is a town institution. It’s been here almost as long as I have! 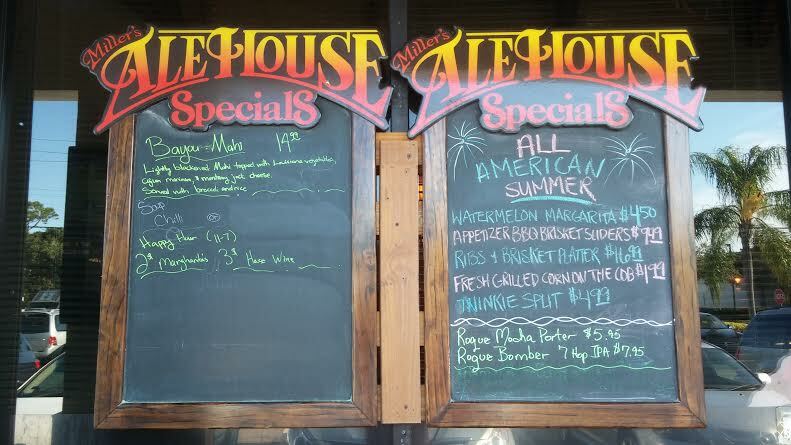 The Jupiter Ale House always has a twenty minute wait for a table, especially during the dreaded time of year us native Floridians call “Season,” when snowbirds from the Frozen North descend upon our tropical paradise (November – June). Now, in the middle of August, the wait is much shorter and our foursome quickly found ourselves in a cozy back booth. We ordered drinks to start and I regret not trying the watermelon margarita, which is a summer special. Instead, my mom and I both got $2 margaritas, also on special. I can toast to that! 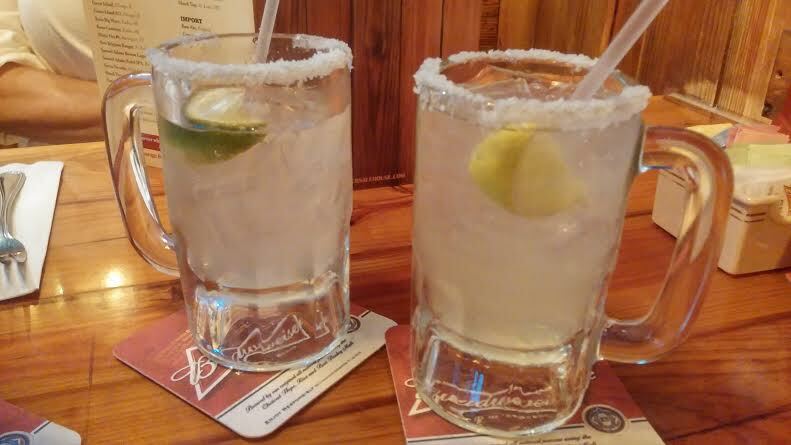 It’s always 5 o’clock somewhere – Alan Jackson said so. We decided to keep with the “rare occasion” theme and did something else that hardly ever happens in our household – we ordered an appetizer. (Gasp!) 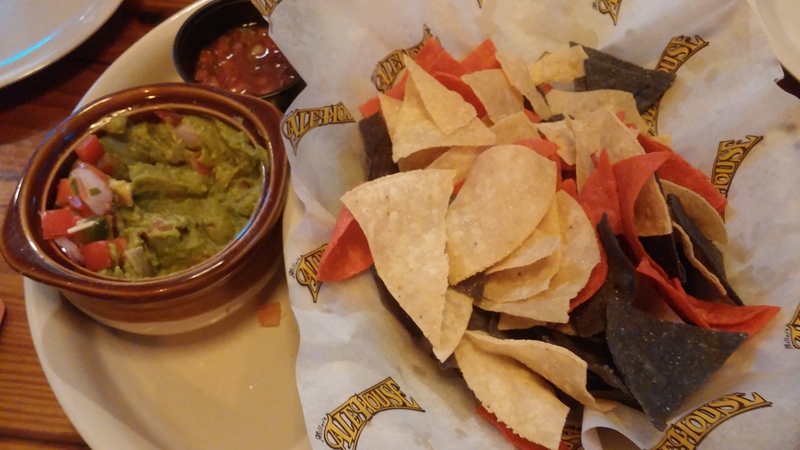 The four of us polished off a plate of chips and guacamole, which we heartily recommend. 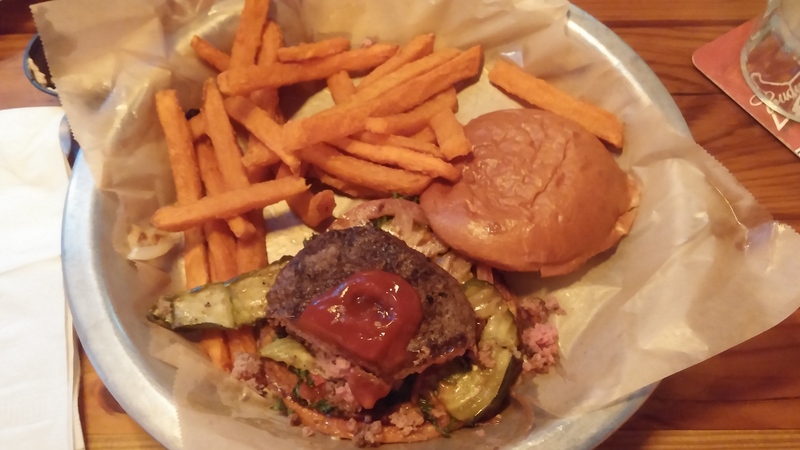 I branched out from my usual order of chicken tenders (I consider myself a chicken tender connoisseur) and instead had a burger with an order of sweet potato fries. I have to admit that the fries were not as good as my parent’s other standby restaurant, Duffy’s, which is also a Palm Beach County based restaurant chain. My burger, which I ordered medium and ate open faced. 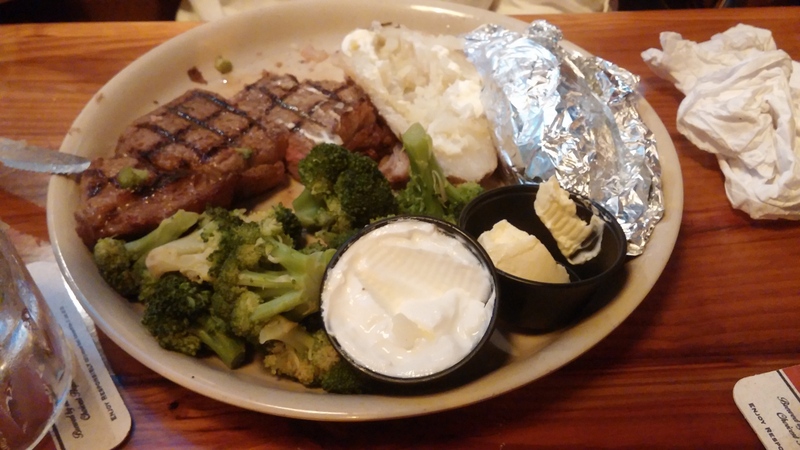 My parents are too cute and both ordered the 12 ounce choice rib-eye steak with broccoli and a baked potato. P surprised all of us with a wild card order. He had been talking about the Zingers all day, the Ale House’s trademarked breaded chicken tenders tossed in a variety of sauces (hot sauce, garlic sauce, Teriyaki sauce… I am beginning to sound like Forrest Gump). 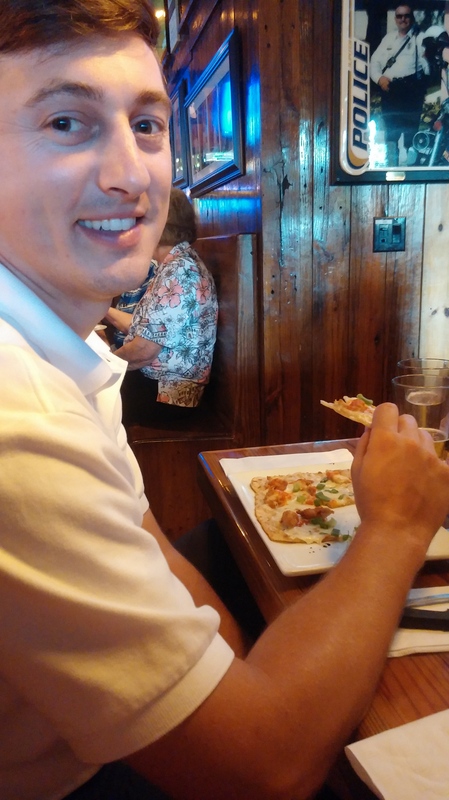 Instead, he ordered the Zinger flatbread: Zingers tossed in hot sauce and garlic sauce served on a crust with bleu cheese sauce, bleu cheese crumbles, and green onions. A little too cheesy for my taste but he loved it. P enjoying his Zinger flatbread. 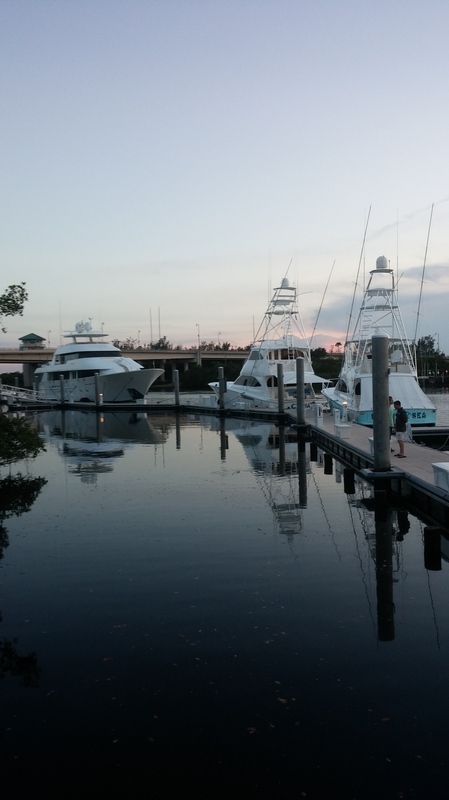 After dinner, we drove over to the new Harbourside Place on the Intracoastal. Harbourside is a controversial addition to Jupiter, a palatial hotel and restaurant mecca built on what was, for the longest time, some of the town’s most valuable vacant property. Some “Old Jupiter” people (those who have lived here since Indiantown Road stopped at Center Street) are unhappy about the development. Other residents are excited about finally having an upscale dining and shopping center in the northern part of the county. I fall somewhere in the middle, appreciating the town’s interest in bringing new businesses to the area while at the same time recognizing our responsibility to preserve our small town heritage and natural areas. Needless to say, the views of our Intracoastal waterway are spectacular. 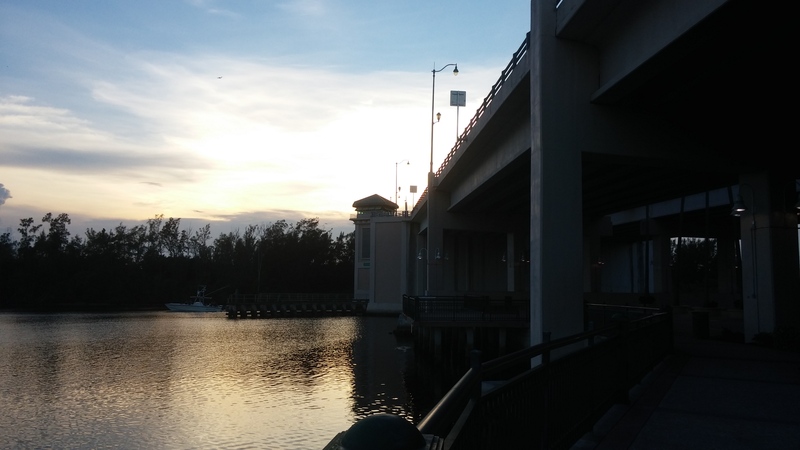 The view from under the Indiantown Road Bridge at sunset. 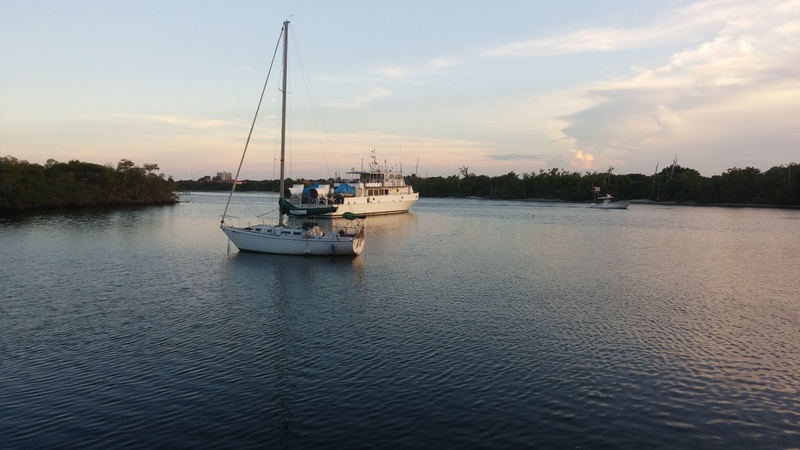 Boats on the Intracoastal waterway at sunset. Boats docked at Harbourside Place. Thank you so much for visiting my blog. I hope you enjoyed it! Jupiter is indeed beautiful.